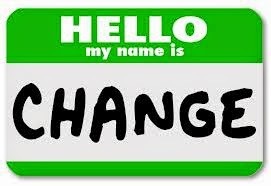 BNI of the Heartland: CHANGE IS GOOD!!! I want to talk about change and how it relates to BNI members and the strength of their chapters. As humans we do not like change; most of the time it takes you out of your comfort zone or your daily routine. People, especially sales professionals, live by routine and when that routine is interrupted it can affect their attitude, their actions, or even their decisions. Ask yourself, do you have a routine with your BNI chapter? I bet you do and when there is change in the chapter, you can either embrace it, and everyone together will succeed, or you can fight it and watch the chapter stay the same, or maybe shrink to the point of dissolving. With the leadership team transition coming on October 1st, there will be changes that the incoming President will bring to the chapter. The changes are based on the goals they will set with the new leadership team. The more the chapter can embrace the changes, the better the chapter will succeed. One choice the new President can make is to have the chapter play the BNI game to motivate the chapter and help with growth. The results should be fun and productive. If none of the members want to change their habits and no one takes the BNI game seriously, then after two months of the game, the chapter will be the same as before. Everyone will be looking at the other members to bring visitors, or to show up on time, or to bring referrals. If you wait for visitors or referrals to just fall in your lap, and that is the routine for your BNI chapter, you might want to look at some options to change like being proactive outside of the 90 minutes of your meeting. The hard part about becoming more than a 90 minute member is the scared gut feeling it brings when you think about handing your business card holder to your customers, or inviting professionals you do not know to your meeting, or making more time for One-To-Ones in your already busy schedule. Would doing any of those things improve your membership? My wife and I are moving our 17 month old daughter from an in-home childcare to a public facility, and at this point we are more nervous and scared for her than she is! On top of that, both of us have had the breakdown of “let’s just leave her where she is, we know it; it works; why change?” But we believe the exposure to other children, and the experience of the public world, will help her grow and prepare her more for kindergarten in a few years. When you feel that hesitation before you invite someone to your chapter, remember the benefits of them joining your chapter. Not just for you and your other members, but the benefits the new member will receive from the chapter. When you hesitate to ask a client or friend to meet with another member of your chapter, remember what the Givers Gain philosophy is about - that when you bring in that referral it will ultimately result in more business for you. Take the challenge to make a change in the way you listen or ask for referrals in your daily routine. Take the challenge to make the change of inviting professionals you know, or even maybe do not know, to your chapter. Make a change on how involved you are with your chapter when it comes to One-To-Ones. Be on time for the chapter meeting. Stick around after the meeting for networking. And finally, be prepared for your Weekly Presentation or your Featured Presentation.